We purchased our tickets through a travel agent in Bangkok. The train would take us to Surat Thani, where we would catch a bus to Krabi. After a surprisingly fresh dinner at the Bangkok train station's food court, we boarded our train and handed our tickets to a conductor. He began walking us through the cars, which were all crowded with people and luggage. Surely we were headed to our own cabin, I thought. 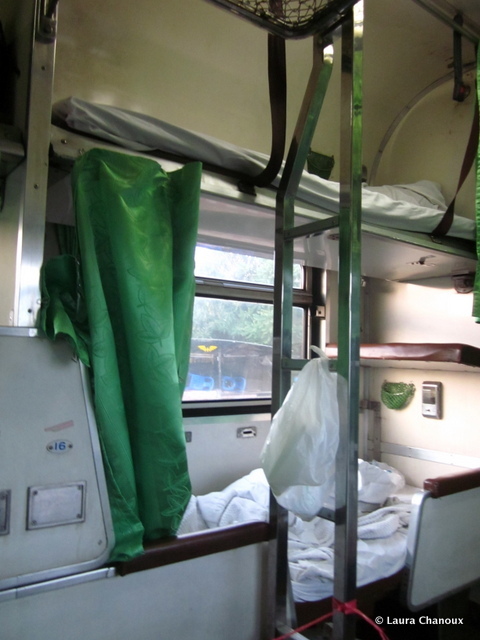 The travel agent had explained that we were buying lower bunks, and I was excited to see what sleeping in trains was like. I pictured the romance and vintage glamor I had seen in so many British films. Then the conductor stopped, gestured to two seats, and left. Eric and I looked at the seats, plain brown and wide. These did not seem to be in a cabin, nor were they the fold-down beds we had expected. An Italian couple next to us was equally confused and grumbled about getting ripped off by the travel agents. The only apparent "upper" or "lower" things were the luggage racks, and who would pay more money just to get a lower luggage rack? Happily, as the train left the station a woman came around serving beer. As Eric and I settled into our wide seats for the duration of the trip, we sipped Singha and I slowly dozed off. An hour or so into our ride, I woke up to banging sounds. One of the train workers was going through the car, pulling out the seats to create beds and pulling a hidden upper bunk down from the ceiling. I watched as he spread out a mattress on the lower bunk, tucked sheets around both, tossed pillows down, and moved on to the next pair. It took less than three minutes for each set. After reading a while longer, I curled up in my bunk, pulled the bright green curtain across, and let the movement of the train rock me to sleep. Cozy bunks that appeared out of nowhere! After a moderately restful night and an early morning, Eric and I took a bus from Surat Thani to Krabi and eventually found our way to our hostel, where we checked in, cleaned up, and immediately fell asleep. I woke up just before 11 PM and read, checked email, and otherwise wished I knew where there was somewhere I could buy food before dawn. Eric also awoke at a surprisingly early hour — if he can avoid it, he is never seen before noon. I realized that, for once, we had a chance to watch the sunrise together. We set out as the sun was breaking through the predawn rainclouds. We walked towards the water while keeping an eye out for breakfast. More on early morning in Krabi soon. Have you ever ridden on an overnight train or bus? I have not ridden a train or bus, but when we took the train back from Orleans (France) we were delighted to find that we were in a Harry Potter-type cabin, even though it was 2nd class ... it was us and like 3 others and there was a little door that shut too. For my other recent trips, though (Giverny and Brussels) we just had regular seats. *I have not ridden an overnight train or bus, that should say ... lol. Ooh, a Harry Potter style cabin sounds wonderful! I hope you took pictures! It sounds like you got to see a few different cities in France - so cool! Yes - we went to Orleans and Giverny for day trips. Orleans is a small little town but it was Sunday and most of it was closed, luckily it was sunny for most of that day so walked around a bit. Giverny is where Monet's house and gardens are :). We also took the (high-speed) train to Brussels for the day, it was a bit more expensive than the bus but the bus was a 4-hour trip each way and this was slightly over an hour each way. I've ridden a few trains in my lifetime - a few that were overnight - but not with the interesting accommodations that you describe. And then to be treated to a breathtaking sunrise at your destination! What a wonderful adventure! It's been exciting to try new things like this! I'm glad you like the photo! It was wonderful to get to see it. Thank you so much for reading! I'm looking forward to hearing that story - 24 hours on a train sounds pretty rough. Hopefully we'll get to meet soon after Eric and I get back to the US!